Weed Wizard - Easy, Eco-Friendly No Chemical Weeding. 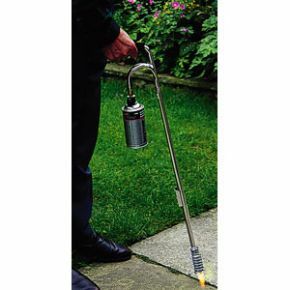 Easy eco-friendly weeding, no chemicals just a touch of the Weed Wizard applies a high temperature flame which instantly destroys the weeds internal cell structure causing them to wither and die within a day or two. Eliminates the need for toxic or hazardous chemicals. Weed Wizard leaves the garden completely safe for children and animals immediately after use. The gas supply is turned on by means of a control knob, and ignites at the end of the Weed Wizard when the piezo electric button is pressed. Ideal for driveways, patios, walls, rockeries, etc.